I hate myself for suggesting this to you guys. Not because I want to be super secretive and hoit the toit all to myself so I can act like my taste buds have better delicious detectors than yours. No. I hate to suggest this food series that focuses on David Chang of Momofuku because it's no longer available to stream online. Which means, you won't be able to see ramen get slurped so deliciously that you realize you don't love anything as much as Chang loves noodles. He loves noodles more than a kid loves bubbles, man. It's impossible not to crave ramen after seeing him eat it. 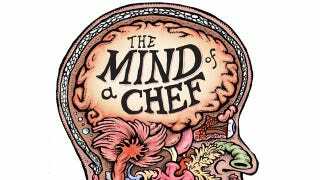 The Mind of a Chef is produced and narrated by Anthony Bourdain and focuses on the well wrinkled brain of David Chang for the entire season. They dedicate entire episodes to Japan to gluttony to soy to egg to pig and more. It's getting a glimpse of how David Chang, perhaps the coolest chef since chefs became cool, sees things. If you didn't already love him for what he did with the pork bun (or if you had no idea who the hell he was), you'll see a constant curiosity on all things culinary. Every time Chang is around something new or awesome or delicious, it's like seeing him meet Santa for the first time (or whatever age it is that you meet Santa and don't cry). You want to love something, anything as much as he loves food. So yeah. I hate to leave you guys hanging like this but all the episodes have recently expired on the PBS website. I'd check out some of the shorts if you can here, peep the PBS TV schedule to see when it airs or buy the DVD when it comes out next year. Either way, watch it and be thankful that there are people like him to make food delicious for people like us.